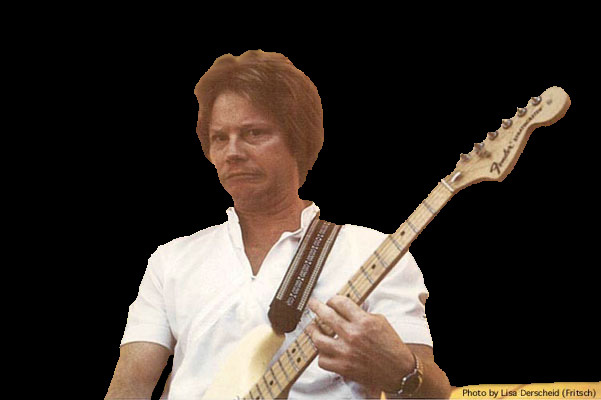 A photo from the 1983, Sacramento Chili Cookoff: "Nice expression, dude. Did you sample the chili before the gig?" Now, I know what you're thinking and that NEVER, EVER happens to rock people on stage. No-o-o-o-o-o-o. We're way too pristine and far removed from any normal human body frailties. It's widely known that in the entire history of rock music, it has never happened, not even once. Just "passing" a proud legacy onto the next generation. In November of 1983, I married for the 3rd time. We would have 2 daughters in the next 3 years. Adorable, ornery, cute little daughters. I'm working on getting them to let me include their pictures in here, but you know how girls can be. On July 3rd, 1984 we played the "DC Beach Party" with The Beach Boys, Hank Williams Jr., Ringo Starr and America (to name a few). This was one heck of a fun day. America was great, as always. I spoke with Mel Tillis backstage and it's true what they say about him being a nice guy and a real gentleman. Hank Williams, Jr. gave Sneed a pair of "Hank Jr." suspenders, which he promptly wore. After the gig in D.C., we all jumped on a plane and flew down to Miami, Florida to play another gig, the very same day, on the beach down there. Great fun and were we ever feeling impressive?!! Rock people like that sort of thing, ya know. One Million People - One Day. Very shallow, but makin' some memories. Yes, indeedie, Louise! 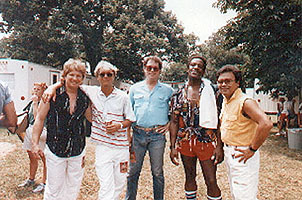 Below left: Floyd and me with America, backstage at the D.C. Beach Party. On the right: Guitar roadie and good friend, the late Doug Burch. He was killed in a motorcycle accident in the late 1990's. A talented young man with a wonderfully gentle disposition. Doug had to fight off the women. He didn't always succeed in that effort. He is missed greatly. By December of the 1984 touring season, I found myself in the position of being the so-called "spokesman" for the musicians, on a business level. I had always been a "fish" in being too outspoken and taking the lead in band matters. Now, remember this: I had already been in a "legal disagreement" with Danny, Chuck and Cory, just 8 or 9 years earlier, and here I was making demands and carrying on quite aggressively. Guess what? I got fired. Si. Gone. History. See ya! Here's a cartoon by Gary Larson that says it all and I just couldn't resist putting in here. This is great. Check it out. Graphic deleted due to FarSide copyright infringement. This was the one showing THREE guys (heavies) having just thrown a dog off of a bridge over a river. The dog was on his way down and he had CEMENT on his shoes. The caption read,"HE BIT THE GODFATHER." Is that perfect, or what? It even has 3 guys in it. It's too perfect to not be included here. So I was gone ... AGAIN. I decided to move out of the Thousand Oaks area of the Los Angeles basin, and relocate back to my hometown of Modesto, where my family lived. This brought a new period for me called my "MISTER MOM" period, but I won't go into that. Just know that until 1988, when we started an Environmental Testing Laboratory, I was MR. MOM and loved it. Oh, it was tiring as hell, no doubt about it. I have great respect for mothers, tending to the needs of infants. More than anything else, it is simply "tiring." The love is what carries you through, as it did for me. I am certainly aware of the inherent situation of one person being home all day with the kids, then when the other comes home, it's "Here. Take the kids. I need a break." Men don't usually understand that particular kind of stress. Still, it's a time of my life I'll cherish forever. All dads should be so lucky.